If you approach Swarm thinking the purpose of the game is to save the little blue morons, then two things will happen: first off you will fail miserably; secondly you’ll probably end up hating the game. Swarm is all about achieving high scores, maintaining score multipliers, collecting DNA and splattering lots and lots of blue gunk. In the process you will be responsible for the genocide of tens of thousands of these rotund retards. Case in point: if you head over to the Swarm website, at the top right corner is a global kill count tracker. At the start of me writing this review, the total Swarmite death toll across our planet was sitting at 41Â 481Â 281. Should you add to these crimes against Swarmanity, or skip Hothead’s genocide simulator? 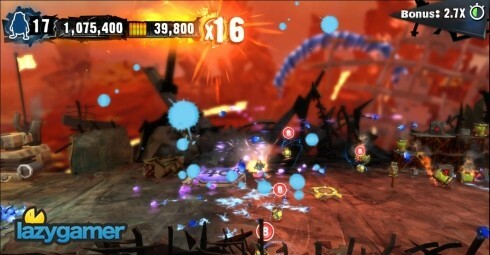 Numerous websites and publications have noted the similarities between Swarm and other games like Lemmings or Pikmin. We did the same thing and, well, we were wrong along with everyone else who made the â€œobservationâ€. In the latter two games you needed to save as many of the diminutive characters as possible. In Swarm it actually benefits you to bump off the little blue guys; there are thousands more were they came from. Don’t feel bad either; I killed 5199 of them within the first eight levels. The Swarmites crash-land on an extremely hostile planet and are tasked with obtaining DNA strands and molecules in order to grow their hive mother. Scattered about each level are five DNA strands; you’ll need to collect a specified amount of them so as to unlock boss battle levels. Aside from DNA strands there are hundreds of purple molecules that need collecting as well. Each molecule adds to your score and increases your multiplier. Reach a checkpoint and that multiplier is carried across and your score is tallied to your total. If you’re fast enough you can maintain a multiplier right from the start of a level, but it will be difficult as hell. In order to pass a level there is a minimum score requirement that escalates as the levels progress. It seems pretty straight forward, but is deceptively tricky. Your multiplier is constantly draining though starts stacking the moment you pick up a purple molecule or kill a Swarmite. Killing one of your little blue guys does net you points, but lose all fifty of them and you’ll be booted back to your previous checkpoint. Fortunately there are numerous respawn points throughout the levels so you shouldn’t ever really be afraid to lose Swarmites. You directly control all fifty Swarmites at once. The control layout does take some getting used to and you will be swapping between a huddled formation and a spread-out one most of the time. The Swarmites can also stack themselves on top of each other to form a precariously balanced totem pole sort of thing in order to reach certain pickups. Mastering the movement of the Swarm will take some time but once you get it you’ll surprise yourself by what you’re able to get the blue mass to achieve. Death is something the Swarmite has come to expect. The game is steeped in black humour (is that term politically correct these days?) and there are medals to collect pertaining to the amount of Swarmites you’ve accidentally killed. The levels are colossal Swarmite death-traps from beginning to end. You will get them impaled, electrocuted, burnt alive, asphyxiated, sliced in half and more. Your total kills are tallied up and split into different categories with numerous medals to work towards as well – which, now that I think about it, is actually a pretty sick idea but wildly entertaining nonetheless. â€œEntertainingâ€ is probably the best word to describe Swarm. Hothead are sticking to their game plan of not taking themselves seriously, and what that has produced is a quirky, sick as hell but very entertaining game. The fundamental gameplay mechanic is fresh and the healthy injection of macabre hilarity helps to drive the whole thing forward. That being said, things do start to become somewhat monotonous and there are moments that are frustratingly difficult. Whether that’s by design or a result of one’s own ineptitude is up for debate. Furthermore the game froze my Xbox about five times during play, but hopefully that will get fixed in a future update. Still, the game is definitely worth looking into if you enjoy off-beat humour, stat-tracking and trying to beat high scores. Oh and in case you were wondering, the global Swarmite death toll at the end of writing was at 42Â 162Â 736. Controls are tricky but once you have the hang of it there’s something wildly satisfying in getting fifty creatures to do what you want. Colourful, sick and very messy, Swarm is rather refreshing. The numerous deaths show a twisted imagination at work, and will appeal to the more macabre out there. The game costs 1200 MS Points (which is R129 if you use Evopoints). I was unable to find the cost on PlayStation 3 as the game has not yet seen a local or European PSN release. For high score junkies the game will have loads of replay value. One of the better downloadable games that’s for sure. Don’t be fooled by its quirkiness; the game gets tough as nails, especially during boss battles. Next article Megarom nabs Square-Enix!